Jared Christopher Monti (20 September 1975 - 21 June 2006) was a Staff Sergeant in the U.S. Army who was posthumously awarded the United States military's highest decoration for valor, the Medal of Honor, for his actions in Afghanistan. He was also posthumously promoted to the rank of Sergeant First Class. He was the sixth person from the wars in Iraq and Afghanistan to be awarded the Medal of Honor. Jared Christopher Monti was born on 20 September 1975, at Abington, MA, to Paul, a school teacher, and Janet Monti. He grew up in Raynham, MA, and even as a child, his adventurous character was already apparent. As a four-year-old, he disappeared from the backyard one day, and his mother later found him hanging from his hood on the other side of the fence. On another occasion, a migraine headache kept him home from school, but he left the house and was later found climbing a tree. Monti became interested in bodybuilding and by the time he graduated had become a New England champion in wrestling. In 1994 he graduated from Bridgewater-Raynham Regional High School at the age of 18. Monti had two siblings, a sister, Niccole, and a brother, Timothy. 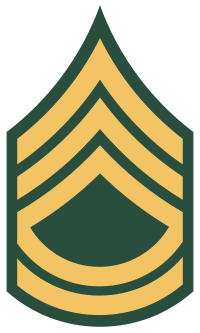 After enlisting in the Army in March 1993, he completed basic training and forward observer training at Fort Sill, OK, and continued his training as a paratrooper with the 82nd Airborne Division. Monti, a fire support specialist, served as a staff sergeant and Fire Support Team sergeant with the 3rd Squadron, 71st Cavalry Regiment, 3rd Brigade Combat Team, 10th Mountain Division. Prior to his service in Afghanistan, he was deployed to Kosovo where he sustained injuries while sky diving. He rejected a medical discharge and re-enlisted to deploy with his unit to Afghanistan in February 2006, as part of Task Force Spartan. On 21 June 2006, Monti served as the assistant leader of a 16-man patrol and leader of a weapons forward observer team tasked with gathering intelligence in Gowardesh, Nuristan Province, in northeastern Afghanistan. The team established a small base on a ridge to support a larger Army operation in the valley below. When the larger operation was delayed, Monti's team ran low on provisions. The helicopter that brought supplies revealed the team's position. That evening, the patrol was attacked by a group of at least 60 insurgents, who had established two positions on a wooded ridge about 50-yards above the patrol and attempted to outflank Monti and his team. The Americans took cover and returned fire, and Monti radioed for artillery and close air support. 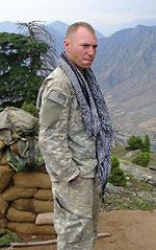 Enemy fire killed Staff Sergeant Patrick Lybert. Another soldier, Specialist Brian J. Bradbury, was severely wounded and left lying in the open between the enemy and the team's position. Staff Sergeant Chris Cunningham, leader of the patrol's sniper team, called out that he was going to try to rescue Bradbury. Monti replied, "That's my guy. I am going to get him." Monti made three attempts to reach Bradbury. On his first, he advanced to within three feet of Bradbury before being forced back by intense machine-gun and rocket-propelled grenade (RPG) fire. His second try was similarly turned back and as the rest of his patrol provided covering fire, Monti advanced a third time but was struck by an RPG. Some news reports indicated that the explosion blew off both of his legs, but this is not supported by family accounts or military records. Monti attempted to crawl back towards cover. He is reported by comrades to have made his peace with God and asked Sgt. Cunningham to tell his parents he loved them. Monti died moments later. At about the same time, the artillery and air support for which he had called began hitting the enemy position, killing 22 of the attackers and dispersing the rest. SPC Bradbury subsequently died during his evacuation when the cable on the rescue hoist lifting him to a 159th Medical Company (Air Ambulance) helicopter broke. The fall also killed Staff Sergeant Heathe Craig, 28, a medic from Severn, MD. Sergeant First Class Jared C. Monti distinguished himself by acts of gallantry and intrepidity above and beyond the call of duty while serving as a team leader with Headquarters and Headquarters Troop, 3d Squadron, 71st Cavalry Regiment, 3d Brigade Combat Team, 10th Mountain Division, in connection with combat operations against an enemy in Nuristan Province, Afghanistan, on 21 June 2006. While Sergeant First Class Monti was leading a mission aimed at gathering intelligence and directing fire against the enemy, his 16-man patrol was attacked by as many as 50 enemy fighters. On the verge of being overrun, Sergeant First Class Monti quickly directed his men to set up a defensive position behind a rock formation. He then called for indirect fire support, accurately targeting the rounds upon the enemy who had closed to within 50 meters of his position. While still directing fire, Sergeant First Class Monti personally engaged the enemy with his rifle and grenade, successfully disrupting an attempt to flank his patrol. Sergeant First Class Monti then realized that one of his soldiers was lying wounded in the open ground between the advancing enemy and the patrol's position. With complete disregard for his own safety, Sergeant First Class Monti twice attempted to move from behind the cover of the rocks into the face of relentless enemy fire to rescue his fallen comrade. Determined not to leave his soldier, Sergeant First Class Monti made a third attempt to cross open terrain through intense enemy fire. On this final attempt, he was mortally wounded, sacrificing his own life in an effort to save his fellow soldier. Sergeant First Class Monti's selfless acts of heroism inspired his patrol to fight off the larger enemy force. Sergeant First Class Monti's immeasurable courage and uncommon valor are in keeping with the highest traditions of the military service and reflect great credit upon himself, Headquarters and Headquarters Troop, 3d Squadron, 71st Cavalry Regiment, 3d Brigade Combat Team, 10th Mountain Division, and the United States Army. On 17 September 2009, President Barack Obama presented Sergeant First Class Jared C. Monti's Medal of Honor to his parents, Paul and Janet Monti, at a formal ceremony in the East Room at the White House. Monti is the 3,448th recipient of the honor since the medal was established by the U.S. Congress during the American Civil War. SFC Monti is the second Medal of Honor recipient from the conflict in Afghanistan; Navy SEAL Lieutenant Michael P. Murphy was awarded the Medal of Honor, posthumously, in 2007. On 13 January 2009, Marc R. Pacheco submitted a petition to the Commonwealth of Massachusetts to designate a state-owned bridge in the town of Raynham as the SFC Jared C. Monti Bridge. The motion passed and the state Senate approved for the bridge to be re-named. A call-for-fire training facility at Fort Sill, OK, where Monti trained, will be named in his honor. The former Pine Plains Fitness Center on Fort Drum has been re-named the Monti Fitness Facility in honor of SFC Jared C. Monti. Sergeant First Class Jared C. Monti was killed in action on 21 June 2006. He is buried at the Massachusetts National Cemetery in Bourne, MA, in Section 11, Site 38. Monti in Afghanistan, in May 2006. 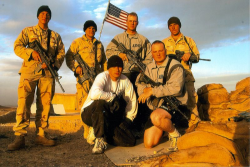 Sergeant 1st Class Jared C. Monti with his team members.